‘To Meet or Not to Meet?’ That is NOT the question. A day in the life of a librarian involves a lot of meetings, am I right? Particularly, as the type-casting goes, academic librarians. We all complain about this. We all wish we had more time and fewer meetings. So why haven’t we solved this? What would we measure in order to do so? I’ve been grappling with these questions as I work on a chapter about how meetings contribute to an organization’s knowledge management. There is so much about this that seems impossible to pare down, especially given the various ways we may experience meetings. An article about what Google has learned from its research on effective teams came across my feed recently. When Googling it again (ha!) in order to pull into this post, I noticed Business Insider covered the topic in 2016 and 2015 as well. Each one builds a little on the last. 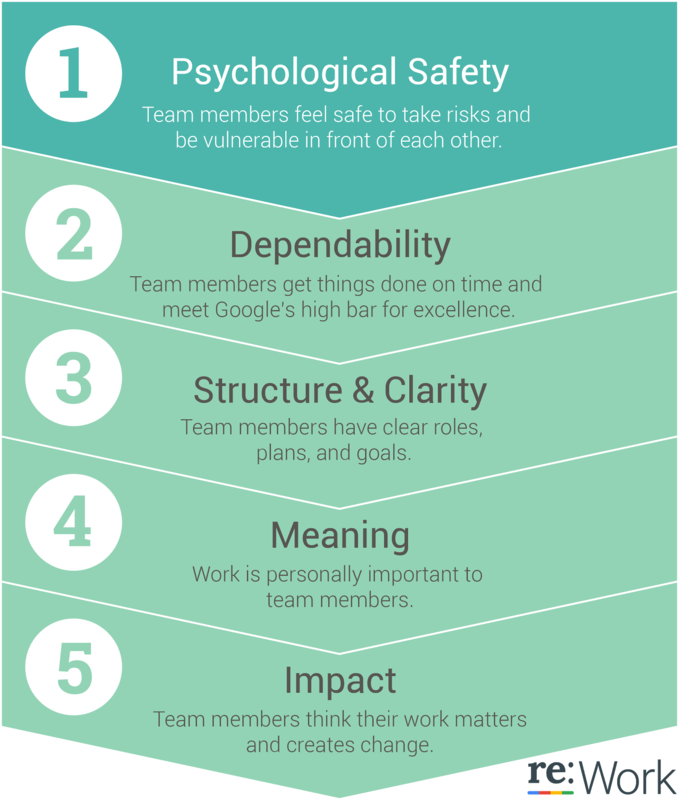 The resulting info graphic shows psychological safety as the quality most indicative of effective teams. Think about that phrase for a minute — psychological safety. This isn’t one of those, “Well of course! That goes without saying, doesn’t it.” kind of things, right? Especially if reversed to imagine what might be wrong with teams that lack this, it’s no wonder the prevailing attitude about meetings is so fraught and our cats and shushing memes so prevalent. What’s interesting to me about the image is its constructive approach to the qualities of effectiveness that build from psychological safety. One of the things I argue in my chapter is that knowledge management assessments, particularly those involving meetings and teams, must similarly be more constructive. 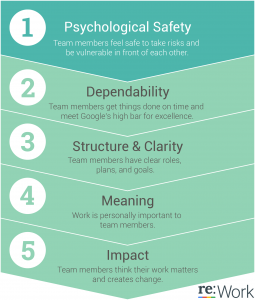 I got to thinking how one measures the quality of psychological safety, specifically, and how that is constructed within meetings in the real (not just academic, not just Google) world. That means examining how people behave in meetings. How does a meeting actually operate to ensure this quality? The best example I can think of for a meeting almost completely structured to ensure psychological safety is a 12-step meeting. You can image how safety manifests through the principle of anonymity, in how members introduce themselves (My name is…and I am a…), even how the space is set up (usually in a circle) and how sharing takes place (usually turn-taking and no ‘cross talk’). While the 12-step approach may seem over the top in the context of a typical library meeting, I think as librarians, we take for granted the sense of security that simple organizing patterns like these can provide. My husband shared that his team uses a checklist at every meeting called norms of collaboration, which I think is attributed to Bill Baker’s Seven Norms of Collaborative Work. How the checklist and norms were described sounded similar to a facilitation tool I’ve used called Plus/Delta. At the end of every meeting you assess what went well (plus) and what could be improved (delta). In this case, what is being assessed is more constructed to specific norms, rather than what I’ve experienced — mainly just accomplishing the agenda or staying on task. #1: Frame the work [of the team/meeting] as a learning problem, not an execution problem. I work in a mostly strengths-based organization where collectively the Learner strength dominates and the Executing domain does not (it ranks only 3rd of 4). This should set my organization up fairly well in meeting this one. Of course, we may need to look at how we frame the work. #2: Acknowledge your own fallibility. Libraries’ predominantly female profession probably overdoes this when it comes to apologizing or non-threatening leadership styles. Although, I think this indicator intends a more authentic approach to one’s owning mistakes. I personally am a big fan of both vulnerability research and reality-based leadership, which kind of book-end this concept in my mind. But, neither have hit the mainstream of library meeting effectiveness. #3: Model curiosity and ask lots of questions. OK. Indicator three, check. Our profession is built on modelling curiosity and asking questions. In addition to a curious, questioning, and service profession, we are also an organizing profession. So the kinds of structures illustrated in the meetings above should come somewhat naturally as well. Yet, who hasn’t resisted (or at least felt silly in) facilitation tools like ice-breakers and ground rules? Surely our organizing talents mean that meetings have an agenda, documented decisions, and assigned action items, right? Aren’t these the very frames our work need in meetings, making them more than just people in a room talking? When I asked my husband how one would foster the collaborative norms approach, he replied, “You don’t foster it; it’s required.” Admittedly it helps to have it codified as a professional standard of practice, as it is in his case. These kinds of specific norms are not codified in the library profession, if looking to ALA or ACRL for example. More often such norms are left to professional discretion. The 12-step meeting structure, which has been codified and working for these groups for over 80 years, has another interesting tradition of operating by the principle of “attraction, not promotion”. This tends to be the approach of adopting new norms in academia as well. This has its perks, don’t get me wrong. If you said I must always abide by Roberts Rules of Order (adopted in many an academic governance meeting), I’d certainly run screaming from the building. But must we rebuke all meeting structure as confining our academic freedoms? I can’t say that structure is the end all be all for ensuring a foundation of psychological safety. I can’t really say the teams and meetings using it always get psychological safety right. But I can say those meetings that have foundation of information organizing structures in place are the more attractive in this respect, and its members who use them attract my respect. This brings to mind one final kind of meeting with something to say on the matter. I sat in on a choir rehearsal where the director was teaching 5-7th graders, who had only just met to sing together three days ago, about the importance of what they were creating together. “Excellence,” she said, “the excellence and hard work that you bring as you sing together has the power to touch someone in the audience and change lives”. I had nearly forgotten this truth from my past musical experiences. This reminder of how our actions can impact others set me up to experience that concert, and even my library meetings, in new ways. Perhaps it really is just a matter of paying closer attention to our craft — the organizing and the service — with each other. This is really interesting – I am always thinking about how to have a more effective meeting. Could you elaborate on exactly what is done at the end of every meeting to assess performance with the 7 norms as a guideline? Does the meeting leader ask for feedback from team members, and they all discuss how effectively they operated according to the norms? How does this work? Hi Tricia! So sorry I am only just now seeing your comment. Yes, how you guessed is exactly how it works. The meeting leader asks for feedback from each meeting participant on how effectively they operated according to the norms in that meeting. I had a chance to listen in to part of it in action recently and its interesting how even newer team members honestly and comfortably share back. I think with teams that are very fluent in these norms, when someone says they didn’t feel like one norm was as effective as it could have been, they (or possibly another) would also take responsibility in their response with how to improve that next time. At any rate, that is how plus/delta is intended to work.